This document is an expanded version of “An Ear for the Market,” an opinion piece published in the New York Times. Ethanol’s time has arrived. After 25 years of fighting just to survive in the face of overt hostility from most of the automobile and oil industries and the environmental community, ethanol has become a darling of investors and politicians alike. The vast majority of both political parties, even those who just two years ago were highly critical, are applauding ethanol. American automobile companies have made the ability of their cars to run on majority ethanol blends a major selling point in their new ads. Wall Street may invest over $3 billion this year alone in new and expanded ethanol production. Investors recognize this is a perfect storm on the upside for biofuels. The price of oil is $70 a barrel. The federal government has guaranteed a national market for ethanol almost twice as large as the current market. Five states have already adopted 10 percent mandated blends. (Hawaii, Minnesota, Missouri, Montana, Washington). Half a dozen other state legislatures are debating a mandate. The handsome federal incentive for ethanol(51 cents per gallon) remains in effect until the end of 2010. The combination of these positive factors has resulted in an unprecedented increase in ethanol production capacity. That increase will be almost 3 billion gallons in 2006-2007, three times the total increase that occurred between 1995 and 2002. At the current rate, American ethanol production capacity may exceed the federal 2012 mandate of 7.5 billion gallons by the end of 2008. Recognizing the increased support for ethanol, and the rapidly increasing production capacity, members of both Houses of Congress have introduced legislation to dramatically increase the current mandate. Some versions would increase the current 7.5 billion gallon mandate of 2012 to 10 billion by 2010 and 30 billion in 2020 and 60 billion in 2030. Not only is the ethanol industry rapidly expanding, it is also dramatically changing its internal structure. In 2003, some 50 percent of all ethanol refineries and perhaps 80 percent of all proposed plants were majority owned by farmers. The average new plant produced about 40 million gallons a year. Today, around 80 percent of new ethanol production is coming from absentee owned plants producing 100 million to 125 million gallons per year. The ownership structure of the new plants significantly weakens the close link between expanded ethanol production and expanded prosperity in the agricultural sector. The farmer is slipping back into his or her traditional role: supplier of raw materials to a concentrated value-added processing and manufacturing sector. The context for ethanol, and biofuels in general, has changed. Policymakers should redesign federal policies to reflect this change. That requires redesigning both the federal ethanol mandate and the federal ethanol tax incentive. The current ethanol mandate is a prescriptive standard, that is, it prescribes a specific fuel. The current mandate is also an absolute mandate, that is, its measure is a specific number of gallons. The states have also adopted prescriptive standards, including the two that have adopted biodiesel mandates(Minnesota and Washington). States, however, have adopted a relative mandates, that is, the measure is a percentage of the transportation fuel. The existing federal mandate should be changed in two ways. First, it should become a performance standard. More than 15 states have already enacted a performance standard for electricity. These renewable portfolio standards require electricity suppliers to increase the percentage of renewable electricity in their supply. The term “renewable” refers to a class of fuels that meet a specific performance standard, not to a specific fuel. For the foreseeable future, wind energy will supply over 90 percent of the renewable electricity. But a renewable portfolio standard is not a wind mandate. It is designed to enable various renewable energy sources to compete with one another, and to allows new renewable fuels to enter the marketplace. The federal government should change the federal ethanol mandate to a renewable transportation fuel mandate. 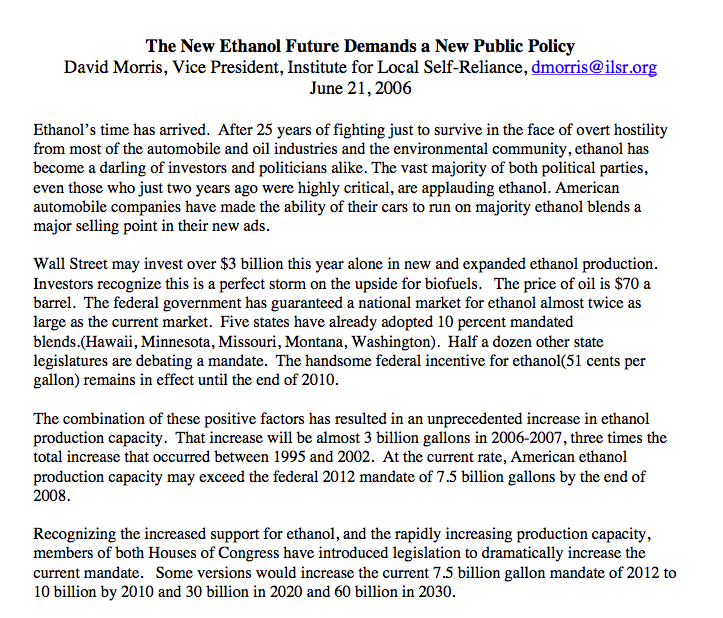 Such a mandate would still be met overwhelmingly by ethanol. But like the renewable porfolio standard, it would enable the introduction of other renewable alternatives (e.g. renewable hydrogen, compressed air, etc.). Second, the mandate should be redesigned to require a specific percentage of fuel supply to be renewable based on energy equivalencies, rather than to require an absolute number of gallons of transportation fuel to be renewable. There are several reasons for doing this. A percentage requirement is more appropriate for a performance standard. And there is a significant difference in the energy content of ethanol and gasoline. A gallon of gasoline contains about 50 percent more energy than a gallon of ethanol. Thus a 10 percent ethanol standard is actually equivalent, in energy terms, to a 7 percent renewable energy standard. Europe has adopted a percentage target goal for biofuels(both biodiesel and ethanol) based on energy equivalency. The U.S. should do the same. For discussion purposes, we propose a 5 percent energy equivalency standard by 2012, which would be equivalent to about 10 billion gallons of ethanol. This should rise to 10 percent by 2020 and 25 percent by 2030. It will be difficult, if not impossible, to politically justify a 51 cent per gallon incentive for ethanol if there is an ethanol mandate for 10 or 20 or 30 billion gallons and oil prices remain high. Ethanol needs no financial incentives to compete when crude oil prices are over $65 a barrel. However, history demonstrates the volatile nature of oil prices. The price of oil in the last 10 years has dropped below $20 per barrel several times. Moreover, the cost of ethanol production is highly dependent on the cost of its feedstock, and although corn prices have not varied nearly as dramatically as oil prices, they do vary. Corn prices briefly topped $4 per bushel in the late 1990s, although they have held fairly steady at about $2 per bushel for most of the last 20 years. How might we redesign the federal incentive to honor the nation’s commitment to both farmers and taxpayers? The incentive needs to be structured to protect the farmer-producer if the price of oil plunges or the price of the feedstock(corn, soybeans, cellulose) jumps. The taxpayer must be protected from having to underwrite handsome subsidies when the biofuels industry no longer needs them. For purposes of discussion, we propose that half the current 51 cent per gallon federal incentive for ethanol be converted into an indexed incentive. The index would be based on a combination of the price of wholesale gasoline(or diesel) and the cost of the agricultural feedstock. Thus, for example, at a corn price of $2.20 per bushel and a crude oil price of $70 per barrel, no incentive would be paid. At a price of $2.50 per bushel and a crude oil price of $40 per barrel, the full 25.5 cents per gallon would be paid. There is precedent for structuring an incentive in this way. Congress based the royalty paid by oil companies to the federal government for offshore drilling on the market price of crude oil. The other half of the federal incentive would be redesigned to take into account the changing ownership structure of the ethanol industry, and the need to link biofuels production and agricultural prosperity. The existing federal incentive is designed to increase consumption. The incentive goes to the blender and marketer, not to the producer of ethanol. In some months, the entire incentive is taken by the middlemen. Typically, about half goes indirectly to the producer. 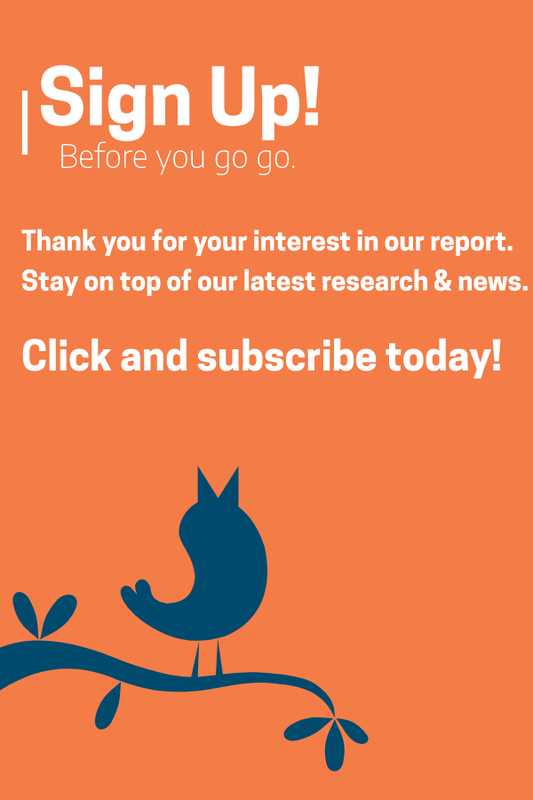 With national mandates there is less reason to offer financial incentives for consumption. But there is still a reason to offer incentives for production, or at least for a certain kind of production. Farmers have traditionally been simply raw material suppliers to an increasingly concentrated processing and manufacturing and retail sector. As a result, the relative purchasing power of their crops have consistently declined. The real price of corn, for example, is no higher in 2006 than it was 30 years ago, even though the price of corn flakes has more than doubled during that time period. In 1974, a bushel of corn could buy about 5 gallons of gasoline. Today a bushel of corn can buy about 2/3 of a gallon of gasoline. Farmers do benefit by an increase in the demand for ethanol. The price of a bushel of corn has increased by 10-20 cents because of the increase in the demand for ethanol in recent years. But the real benefit to the farmer occurs when he or she becomes a part owner in the manufacturing plant. Farmer-owners receive, on average, about 50 cents a bushel in dividends per year, and more than $1 per bushel in very profitable years. Farmer-owners can also use their ownership in an ethanol plant as a hedge against a drop in the price of their raw material. If the price of corn falls, so does the production cost of ethanol; all other things being equal, refinery profits and therefore dividends will rise. How might Washington redesign the federal incentive to reflect the realities of an increasingly absentee-owned, large-scale ethanol industry? Transform part of the federal incentive from a gas tax exemption for those who market the ethanol into a direct payment to those who produce it. Minnesota did this in the 1980’s, transforming an incentive for consumption into an incentive for production. In the early 1980s, Minnesota had an ethanol incentive that mirrored that of the federal government. It offered a partial state gas tax exemption for each gallon of ethanol sold in the state. The incentive worked. Ethanol sales increased. But no ethanol production occurred in Minnesota. Minnesota farmers demanded that public monies be invested more wisely. The legislature responded by converting the pump credit into a producer payment. Instead of a partial gas tax credit, the legislature paid producers 20 cents per gallon. But there were conditions attached. The ethanol had to be produced inside the state, thereby spurring economic development. The payment was only for the first 15 million gallons produced. There was no limit to the scale of the ethanol facility but only the first 15 million gallons received an incentive. And finally, the payments stopped after 10 years. Thus it was not an indefinite and open ended public subsidy. The redesign of Minnesota’s incentive ushered in what came to be known as the Minnesota model: more than a dozen largely farmer owned, small and medium scaled biorefineries. The new federal producer payment should take a page from Minnesota’s biofuels playbook. The objective of the redesigned incentive should be to spur many biorefineries in many parts of the country, and to spur widespread local and farmer ownership of these new biorefineries. For discussion purposes, we propose that the new credit pay 15 cents per gallon for the first 20 million gallons produced each year for an absentee owned plant, and 25 cents per gallon if the plant is majority owned by farmers or local residents. No plant should be able to receive payments for more than 10 years. The federal government does have a 10 cent per gallon tax credit for the first few million gallons produced from “small” plants. But its definition of small has changed from 10 million gallons in the early 1980s, to 30 million gallons in the late 1990s, to 60 million gallons in the 2005 energy bill. We recommend that the federal incentive establish a 40 million gallon size limit to plants to qualify for the producer payment. Some may argue that we can more quickly expand biofuels production if we encourage 100 million or even 150 million gallon plants, and large plants can produce ethanol more cheaply. This may be true, but to a limited extent. The economies of scale of ethanol plants peaks at about 40 million gallons. There are some engineering economies of scale in much larger plants, but there are also diseconomies of scale. For example, the feedstock needs to come from further away, increasing transportation costs. And the ethanol needs to be sold further away, increasing transportation logistics complexity. And the important byproduct of corn ethanol facilities, animal feed, must be dried in order to be exported long distances. This dramatically increases the energy costs of making the ethanol, since the largest single use of energy in the ethanol plant is for drying the grains. Small facilities often can sell a portion, or all of their animal feed wet to nearby livestock. Drastically changed times call for a drastically changed federal biofuels incentive, one that minimizes the long-term costs to America’s taxpayers while maximizing the long-term benefits to our rural communities and farmers. In another report, A Better Way To Get From Here to There (December 2003), I argue for an alcohol-electricity transportation strategy where electricity becomes the primary propulsion source. If this were done, using plug-in, flexible fueled, hybrid electric vehicles, the engine’s fuel requirements could drop by 75 percent. It might be possible to restructure the percentage requirement so that it focuses only on the engine fuel. If that were the case, the percentage levels could increase substantially as part of a dual fueled transportation policy. is the author of five books on energy, including The Carbohydrate Economy. He directs the Institute’s New Rules Project.